梁红霞, 余艺华, 王萌, 石贞玉, 皇甫超申, 胡国强, 厉永强, 刘彬. N-甲基环丙沙星氟喹诺酮查尔酮类衍生物对人胰腺癌BxPC-3细胞凋亡和自噬的影响[J]. 中国药理学通报, 2018, 34(8): 1133-1138. LIANG Hong-xia, YU Yi-hua, WANG Meng, SHI Zhen-yu, HUANGFU Chao-shen, HU Guo-qiang, LI Yong-qiang, LIU Bin. Effect of N-methylciprofloxacin-based fluoroquinolone-chalcone derivative on apoptosis and autophagy of human pancreatic carcinoma BxPC-3 cells[J]. Chinese Pharmacological Bulletin, 2018, 34(8): 1133-1138. Abstract: Aim To study the effect of N-methylciprofloxacin-based fluoroquinolone-chalcone derivative 1-cyclopropyl-6-fluoro-7-(4-methyl-piperazin-1-yl)-3-[2-(3, 4, 5-trimethoxy-benzoyl)-vinyl-1-yl]-quinolin-4(1H)-one (HGQ7) on apoptosis and autophagy of pancreatic carcinoma BxPC-3 cells in vitro. Methods Cell viability was analyzed by MTT assay. 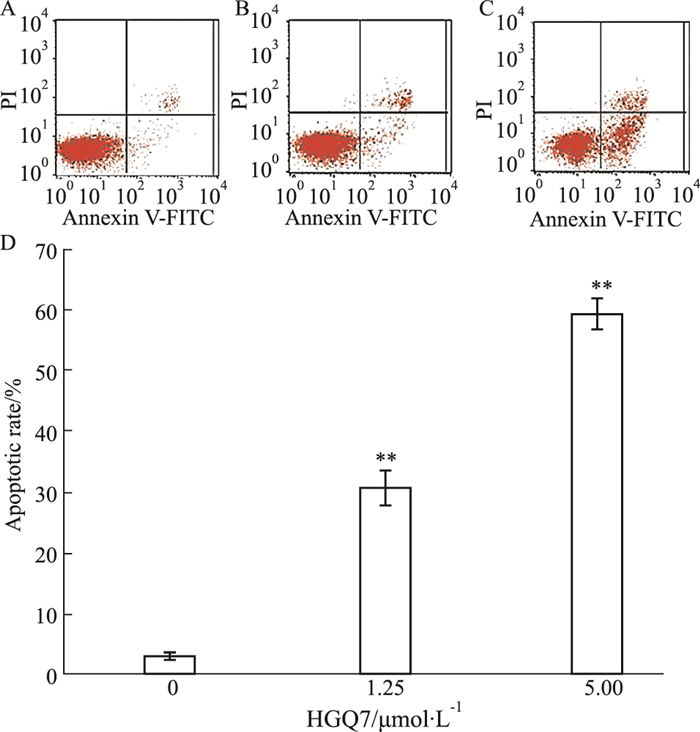 Cell apoptosis was determined by flow cytometry (FCM) with Annexin V-FITC conjugated propidium iodide (PI) staining and TUNEL assay, in which chloroquine (CQ, an autophagy inhibitor) was used to inhibit autophagy. 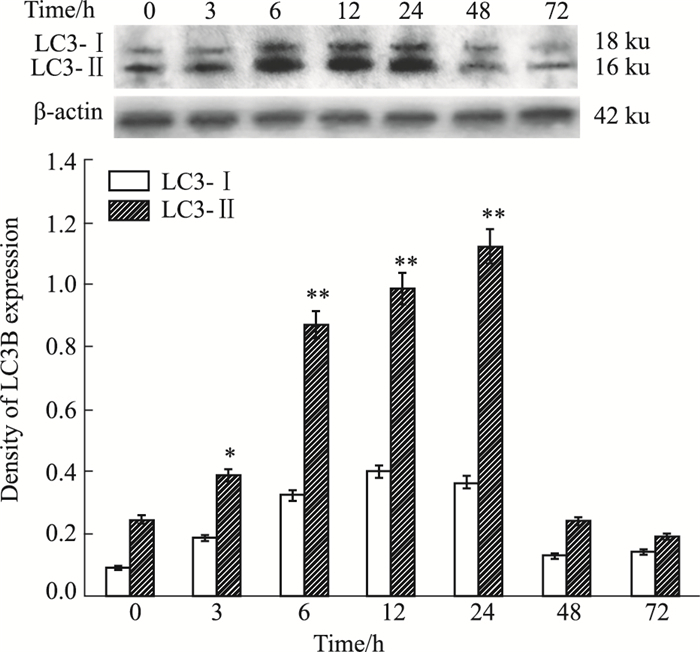 The expressions of autophagy marker protein microtubule associated protein 1 light chain 3(LC3) were detected by indirect immunofluorescence and Western blot. Results HGQ7 showed significant proliferation inhibition activity on BxPC-3 cells. IC50 of 24 h and 48 h was 4.952 μmol·L-1 and 4.564 μmol·L-1, respectively. Treatment of BxPC-3 cells with different concentrations of HGQ7 for 24 h increased the percentage of the apoptotic cells (P < 0.01). With the increase of time of exposure to HGQ7, the expressions of autophagy-related proteins LC3-Ⅱof BxPC-3 cells increased, reaching peaks during 6~24 h, but decreased afterwards. 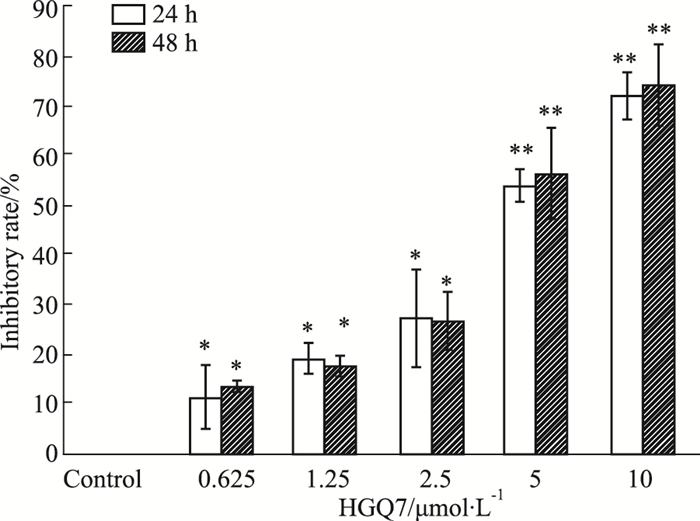 The autophagy inhibitor CQ further decreased the viability of cells treated by the low dose HGQ7 (0.312 5~2.5 μmol·L-1) and increased the percentage of the apoptotic cells. But CQ with high dose HGQ7 (5~10 μmol·L-1) reversed the proliferation inhibition and pre-apoptosis activity of HGQ7 on BxPC-3 cells. Conclusions HGQ7 could induce apoptosis and autophagy of BxPC-3 cells. The autophagy might play a protective role in low dose HGQ7 exposure of BxPC-3 cells. But with high dose HGQ7 group, the autophagy may further decrease the viability and increase the percentage of the apoptotic BxPC-3 cells. 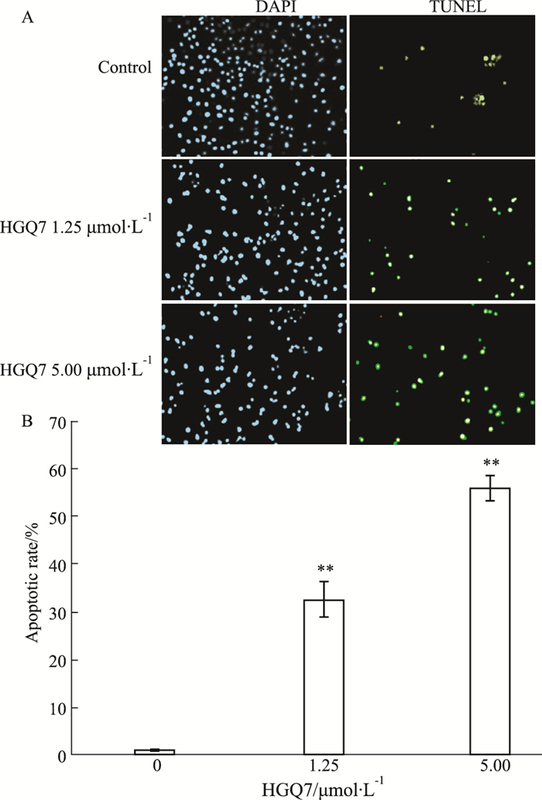 Fig 3 The apoptotic rate of BxPC-3 cells after treatment with HGQ7 for 24 h(x±s, n=3) A: Control group; B: 1.25 μmol·L-1 HGQ7; C: 5.00 μmol·L-1 HGQ7; D: Apoptotic rate detected by Annexin V-FITC/PI flow cytometry. **P < 0.01 vs control. Fig 5 Induction of autophagy of BxPC-3 cells treated with HGQ7 for 24 h evaluated by an immunofluorescence assay (scale bar=50 μm) A: Control; B: HGQ7 1.25 μmol·L-1; C: HGQ7 5.00 μmol·L-1. Fig 8 Effects of HGQ7 and CQ on apoptosis of BxPC-3 cells (x±s, n=9) Representative images were taken(×100), nuclear stain(DAPI, A) and apoptotic stain (TUNEL, B) overlaid. 1: Control; 2: CQ (6.25 μmol·L-1) 3: HGQ7 (1.25 μmol·L-1); 4: HGQ7(1.25 μmol·L-1)+CQ (6.25 μmol·L-1); 5: HGQ7 (5.00 μmol·L-1); 6: HGQ7 (5.00 μmol·L-1)+CQ (6.25 μmol·L-1). 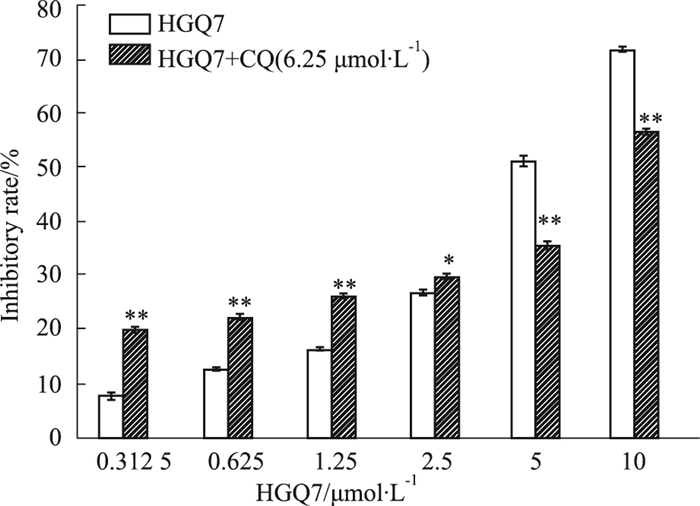 #P < 0.05 vs HGQ7 (1.25 μmol·L-1) group; **P < 0.01 vs HGQ7 (5.00 μmol·L-1) group. Carew J S, Kelly K R, Nawrocki S T. Autophagy as a target for cancer therapy: new developments[J]. Cancer Manag Res, 2012, 4: 357-65. 霍菲, 唐乃夫, 范媛媛, 等. 苯甲醛左氧氟沙星席夫碱诱导人肝癌细胞凋亡作用[J]. 中国药理学通报, 2015, 31(6): 821-6. Huo F, Tang N F, Fan Y Y, et al. Benzaldehyde levofloxacin schiff base induces apoptosis of human hepatocarcinoma cells[J]. Chin Pharmacol Bull, 2015, 31(6): 821-6. Ge Y Y, Shi Q, Zheng Z Y, et al. MicroRNA-100 promotes the autophagy of hepatocellular carcinoma cells by inhibiting the expression of mTOR and IGF-1R[J]. Oncotarget, 2014, 5(15): 6218-28. Kabeya Y, Mizushima N, Yamamoto A, et al. LC3, GABARAP and GATE16 localize to autophagosomal membrane depending on form-Ⅱ formation[J]. J Cell Sci, 2004, 117(Pt 13): 2805-12. Chinese Pharmacological Bulletin, 2018, 34(8): 1133-1138.